PETALING JAYA: SP Setia Bhd's award-winning development in Johor, Setia Eco Gardens bagged another FIABCI Prix d'Excellence award at the 2012 FIABCI Prix d'Excellence Awards Ceremony held in St Petersburg. In a statement, SP Setia said the award marked the fourth international award for SP Setia and the second for Setia Eco Gardens. Setia Eco Gardens emerged as the winner in the Specialised Project (Purpose-Built) category for Eco Greens. Eco Greens is a 28-acre park complex in Setia Eco Gardens comprising a town park and the famed Eco Gallery, which features a green wall that has since become an iconic landmark for the 948-acre township. 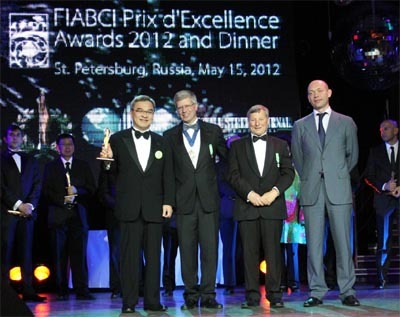 The 2012 FIABCI Prix d'Excellence Awards saw 14 winners from seven countries namely Malaysia, Singapore, India, Taiwan, Russia, Hungary and Switzerland. “We are truly honoured to be recognised with a fourth Prix d'Excellence Award from FIABCI International and are proud to represent Malaysia on the real estate world stage,” SP Setia president and CEO Tan Sri Liew Kee Sin. He said the win marked another milestone for Setia Eco Gardens and was a testament to the group's commitment in building sustainably. “The design and layout of Eco Greens and the eco facilities fully reflect the group's development philosophy of Live Learn Work Play. “Setia Eco Gardens has introduced a new standard of living to the state of Johor and its success is testimony to the fact that the entire spectrum of the community can share equal access to a quality living environment,” said Liew. Located at the main entrance to Setia Eco Gardens, Eco Greens has become the township's signature landmark and recognized not just by residents of Johor Baru but visitors from Singapore and other countries. It is also one of the most prominent landmarks in Iskandar Malaysia by virtue of it being the first eco park. This latest recognition by FIABCI also makes SP Setia the only Malaysian developer to have won four FIABCI Prix d'Excellence Awards. The company's three earlier awards were won by Setia Eco Park in Shah Alam for Best Master Plan (2007) and Best Residential (Low-Rise) Development (2011) and Setia EcoGardens for Best Master Plan (2009).